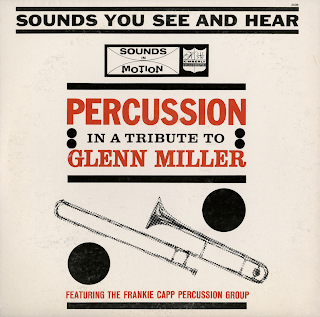 From the back cover: Frankie Capp is not a newcomer to the percussion world. He is one of the top men in the jazz field today, being featured as the third man in the Andre Previn trio and as featured soloist with the Dave Pell Octet. 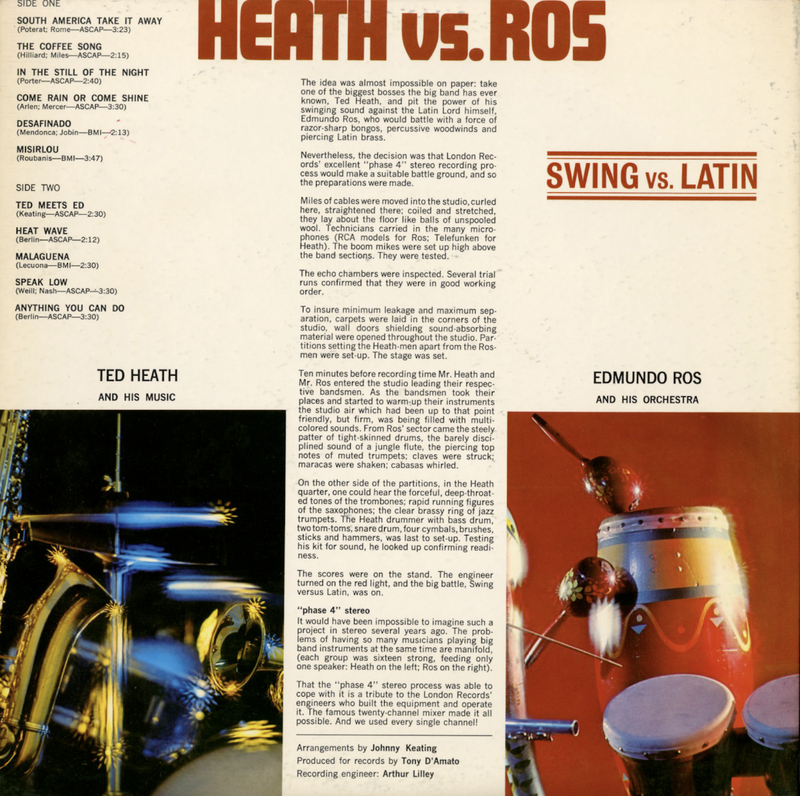 He has also been with such aggregations as Neal Hefti, Billy May, Harry James, Shorty Rogers and Stan Getz. 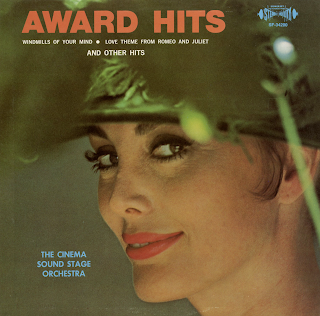 He has at various times worked with Peggy Lee, Ella Fitzgerald and David Rose. At present he is one of the busiest studio musicians in Hollywood and we are very happy to present him as a bandleader in his own right. Emil Richards, one of the outstanding vibraphone players of our day, started as a legitimate concert and symphonic percussion player of the Hartford and The New Britain Symphonies. In 1956 he joined the George Shearing group and stayed with him until he made his home on the West Coast in 1960. Since that time he has played with the Paul Horn group and has been very busy as a free lance studio musician. From the back cover: Domenico Savino was born in Taranto, Italy, in 1881. He attended the Royal Conservatory of Naples, majoring in composition and piano. Arriving in the United States at an early age, he soon began making a name for himself – as a matter of fact, he began making two names for himself. Some of his works were published under the nom de plume of D. Onivas. A growing reputation earned him an offer from one of the leading record companies. Savino became musical director for Pathe Phonograph. He functioned as a conductor, and also as a supervisor of recording sessions. He guided some of the best-known singers of the day through the intricacies of recording techniques. Among them were grand opera's famed Claudia Muzio; Tito Schipa with his modest tenor voice and memorable artistry; and the exceptionally beautiful Lina Cavalieri. 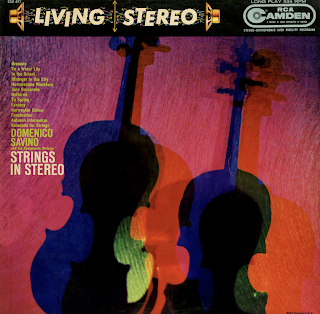 Ever alert to the promise that new technical developments held, Domenico Savino was one of first to realize that motion pictures offered a fertile field for musical expression. He penned many effective orchestral background music scores for the "silent" films. Both M-G-M and Twentieth Century-Fox utilized his talents. He did the music for the film "The Patriot," which starred one of filmdom's all-time greats, Emil Jannings. Savino retained a deep interest of the music business, and is reputedly the first musician to arrange a popular song in symphonic style. 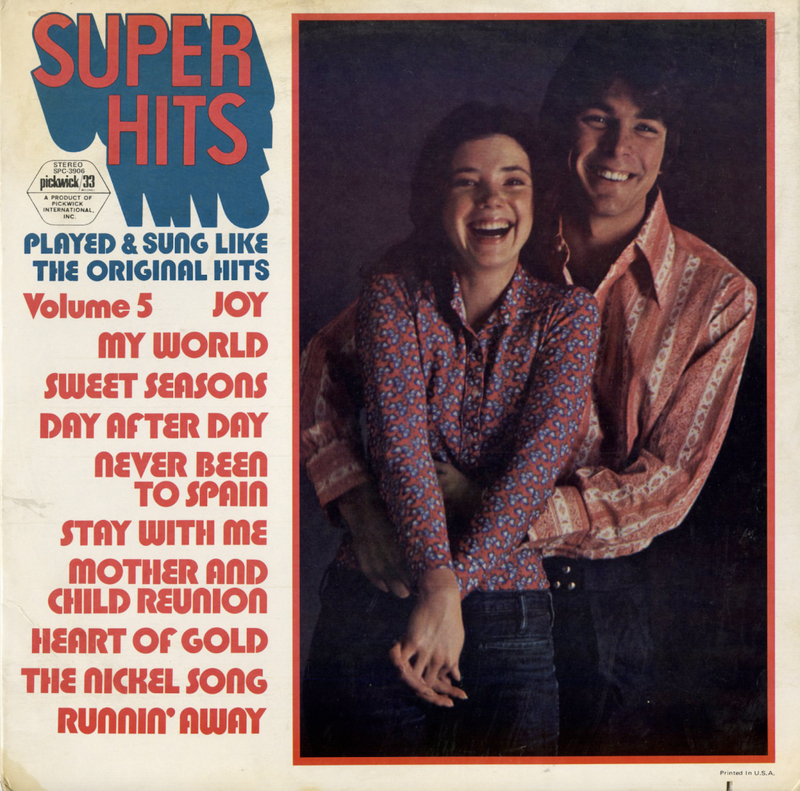 It would be difficult to find a phrase of the music business in which Savino was not active at one time or another. For a while, he was chief editor of one of the most prominent music publishing houses in this country, the Robbins Music Corporation. He was also an important stockholder; and when M-G-M purchased the Robbins Music Corporation, Savino was compensated in an amount that gave rise to some fantastic rumors in Tin Pan Alley. Savino admitted that the payment ran well into six figures, but declined to be too specific. Long-time music lovers will recall Domenico Savino's work on such radio programs as the Paramount Hour, the La Paling Cigar program, and the American Telephone and Telegraph Hour. 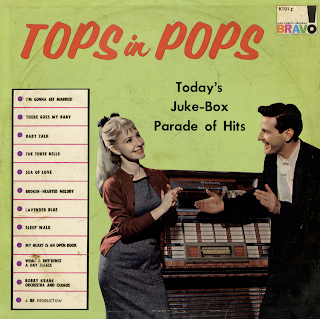 Savino also spent some time as musical director of one of the major radio networks. The financial problem, which has proved a stumbling block for many a talented musician, was no great obstacle for Savino. After earning an excellent living for a number of years in the popular music field, he found himself in an economic position which permitted him to retire to concentrate on composing classical music. With over 900 compositions to his credit, Savino could count on a steady income from his membership in the American Society of Composers, Authors and Publishers – popularly known as ASCAP. Waltz From "Serenade For Strings"
On the cover: New York City artist, Barbara Bert has rendered an exciting cover story for this album: an oil painting whose colors, bold brush strokes and dramatic composition bind together the conception so appropriate to the music contained on this record – fire & frenzy! 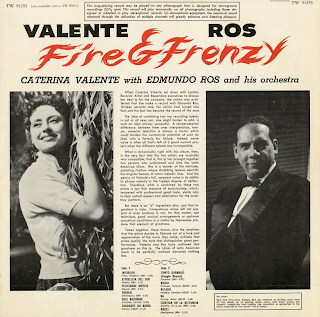 From the back cover: When Caterina Valente sat down with London Records' Artist and Repertoire executives to discuss her next LP for the company, the notion was proffered that she make a record with Edmundo Ros; thirteen seconds later the notion had turned into fact, and the fact has become the record of the year. 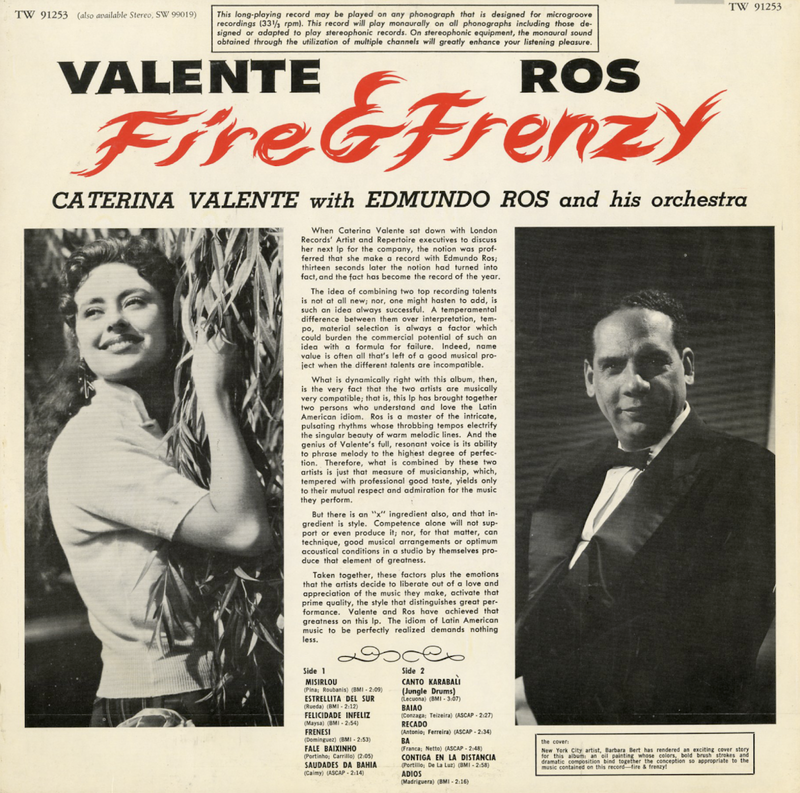 From Billboard - February 6, 1961: Caterina Valente does a superb job on this set of Latin tunes most of which fall into standard category. Edmundo Ros' fine work does an exceptionally fine job of backing the thrush. Besides standards like "Misirlou," Adios" and "Frenesi" there are not so often heard but equally intriguing tunes like "Estralita Del Sur" and "Felicidade Infeliz." The excellence of the performance and the names involved might make the set a consistent seller. The trumpet used on the cover courtesy of the Conn Band Instrument Corp.
Trumpet added on tracks 2, 6, 7, and 8. From the back cover: Cat was born in Greenville, S. C., but was orphaned at the age of 7 and raised in the Jenkins Orphan Home at Charleston, S. C. "At the Jenkins Home school they taught a lot of trades if you wanted to learn any." Anderson recalls. "I heard Jabbo Smith and Peanuts Holland, who were there, and later a record by Louis Armstrong, Laughin' Louis and Basin Street Blues. I studied all the brass instruments I can still play them today, but I'd be afraid to. I carry around a trombone, but it's more for practice than for performance." The education Anderson received at the Jenkins Home laid the groundwork for his career. He toured for three-years with the Carolina Cotton Pickers, four years with the Sunset Royal orchestra, and worked with the bands of Erskine Hawkins, Lionel Hampton, and Lucky Millinder before joining the Ellington band late in 1947 for a brief venture as a leader, but the times were bad for big bands and he rejoined Duke in 1950. 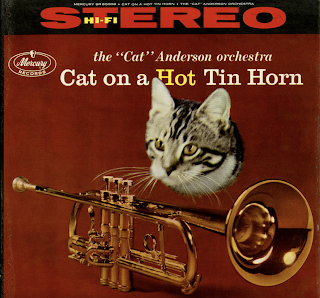 To keep himself at the required edge for his activities with Ellington's trumpet section, Cat practices about 2 1/2 hours a day. "I just have to do that to keep versatile in the things that I play," he says. "In the band, every member has to be versatile. I play exercises and practice according to a system I made up." He travels with two huge Connstellation trumpets, one for the job and the other for hotel room practicing. Cat is a good-natured, barrel chested man who looks considerably less than his 42 years. He is the first to break into important contribution to the art to date has been his extension of the range of his horn. Until he bought his incredible upper register into the Ellinton band, there had been very few trumpeters on whom composers could count for the filling out of important chords, or around whom they could build the soaring, emotional brass climaxes so popular today. 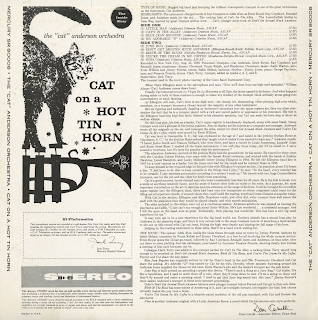 With Cat in the section, Ellington and Billy Strayhorn could, and often did, write trumpet lines well above the staff with the assurance that they would be played cleanly, with superb articulation. The sides included in this album were cut a continuous session. Anderson admits he was pleased on hearing the playbacks, and add, "I just can't say enough about Ernie Wilkins. He's just wonderful... a wonderful arranger. And I felt the guys on the band were so great. Technically, their playing was wonderful. This has been a new big band experience for me. Available from online vendors so I will not be posting a sample. Presented here to share the cover art and jacket excerpts. 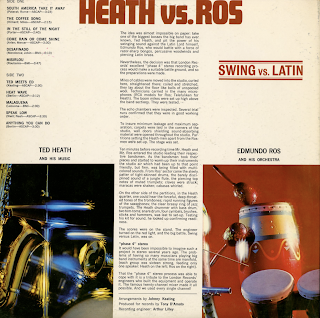 From the back cover: Ten minutes before recording time Mr. Heath and Mr. Ros entered the studio leading their respective bandsmen. As the bandsmen took their places and started to warm-up their instruments the studio air which had been up to that point friendly, but firm, was being filled with multicolored sounds. 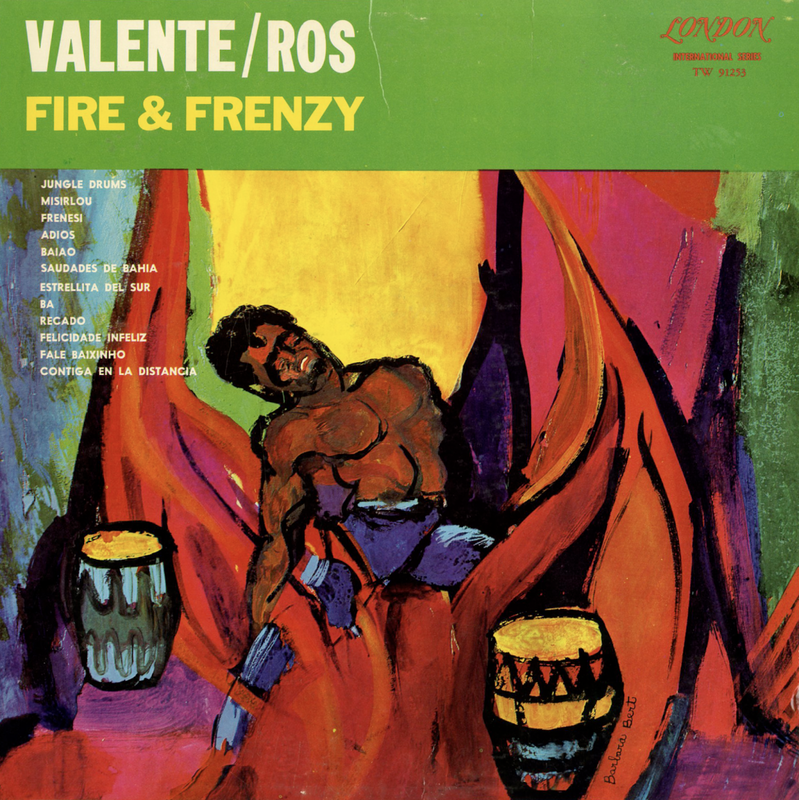 From Ros's sector came the steely patter of tight-skinned drums, the barely disciplined sound of a jungle flute, the piercing top notes of muted trumpets; claves were struck; maracas were shaken; cabanas whirled. On the other side of the partitions, in the Heath quarter, one could hear the forceful, deep-throated tones of the trombones; rapid running fingers of the saxophones; the clear brassy ring of jazz trumpets. 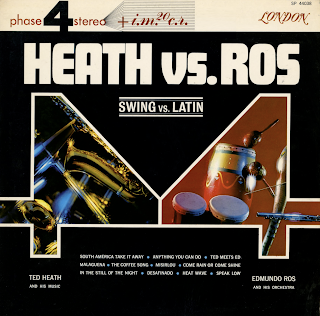 The Heath drummer with bass drum, two tom-toms, snare drum, four cymbals, brushes, sticks and hammers, was last to set-up. Testing his kit for sound, he looked up confirming readiness. The scores were on the stand. 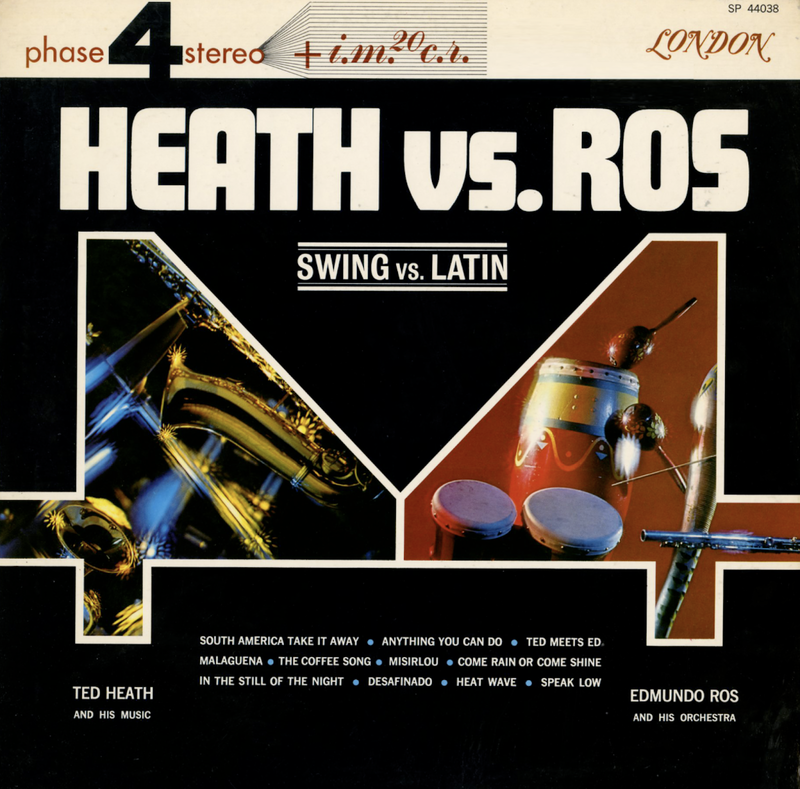 The engineer turned on the red light, and the big battle, Swing versus Latin, was on. From the back cover: Bill Davison was born in January, 1906. This simple statistic takes on significance when you start adding on your fingers and note that he was therefore in his forties when these recordings were made and is at this writing (1956) at the mid-century mark. Nevertheless, there is more than enough fire and strength in his horn to arouse considerable envy in even the most spirited performer half his age. Davison's birthplace was Defiance, Ohio (a place name that can lead searchers after symbolic coincidence and/or puns to draw all sorts of parallels with the usually wild sound of his horn). His first instrument was the banjo; as a banjoist and when he first switched to cornet, he was a member of assorted undistinguished bands in Cincinnati and thereabouts. 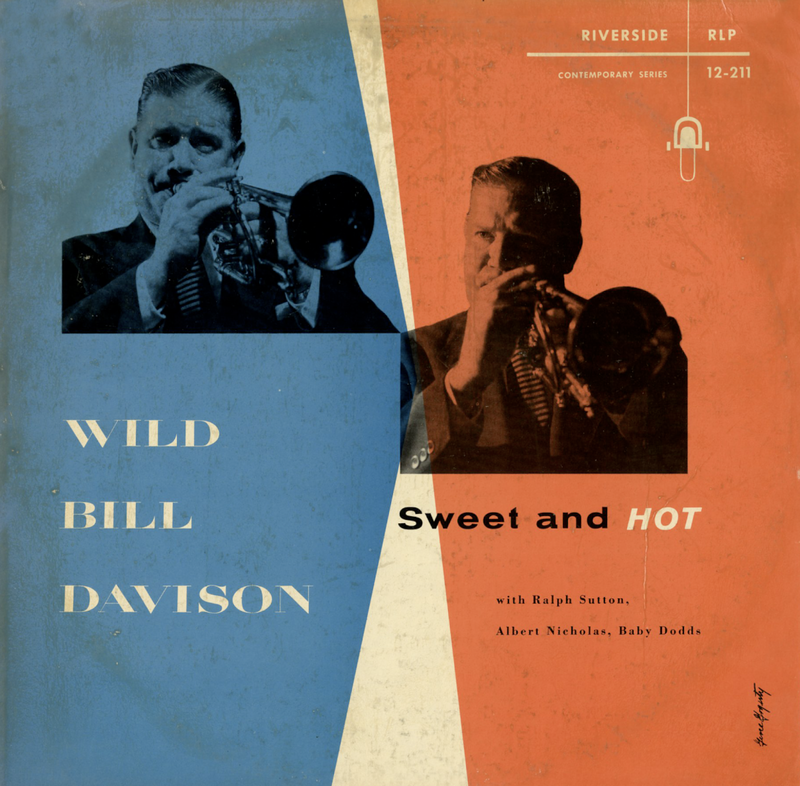 According to some accounts, Bill was at first no better than his surroundings called for, but by the mid-'20s he had (like a good many other young horn men) heard Armstrong and Beiderbecke, and had fallen under the spell of honest creative jazz. He has been playing, ever since then, in much the same full and aggressive style he displays here. But it took Davison a while to make his presence really felt on the jazz scene. Later in the '20s he played with such midwestern bands of those of Chubb Steinberg and Benny Meroff, which have been described as "genuinely corny." His earliest recordings were with these groups, and a couple of them do manage to testify rather clearly that Bill deserved to be in better company. He did work briefly with the Chicago jazz crowd, but did not record with them. (It might as well be set down here, as it is in most accounts of Davison's career, that for quite some time he was identifiable to jazz fans only as their driver of the car at the time the brilliant clarinest Frank Teschebacher met his death in an auto accident). Bill led groups in Milwaukee throughout the '30s and it was not until 1942 that he first struck New York. "Struck" is no exaggeration. A long stand at Nick's established his reputation with local fans; he recorded with George Brunis, Eddie Condon and others; and when Condon's own club was opened just after the end of World War II, Davison became just about a staple item there and – along with Condon – just about a living symbol of latter-day Dixieland. During 1947, Wild Bill was a mainstay of the series of weekly Mutual Broadcasting System programs, produced by Rudi Blesh under the overall title of "This Is Jazz," that marked the only serious inroads made by unadulterated jazz into commercial (even though unsponsored) network radio. The personnel consistently represented the best available talent of its kind, and the lineups on the selections issued here are typical: Albert Nicholas, Edmond Hall, and on occasion their great New Orleans colleague, Sidney Bechet; Harlem trombonist Jimmy Archey; pianists like Ralph Sutton and Jimmy Johnson; and usually a solidly traditional Danny Barker-Pops Foster-Baby Dodds rhythm section. Quite often, as here, the group was lifted and driven by the fierce Davison horn. 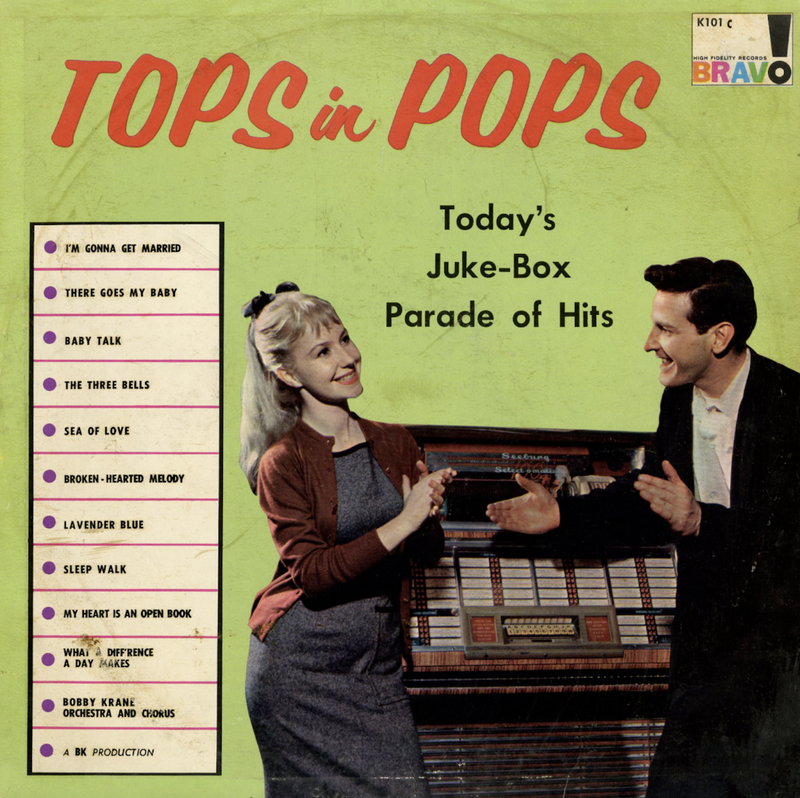 The Side 2 selections are from the following 1947 broadcasts #1 - July 26; #3 - June 21; # and 4 - September 27; #5 - July 5; #6 - August 2. 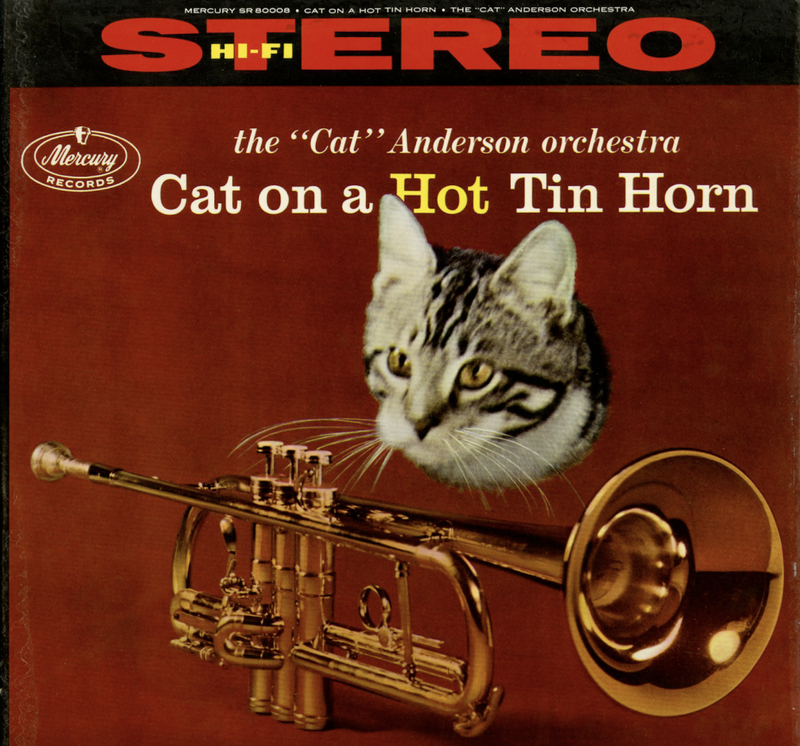 The more unusual examples of the richly romantic potentials of the Davison horn are from a recording session that also featured Sutton, Archey and Garvin Bushell, a skilled and versatile reed-man whose credits range from playing with Jelly Roll Morton to playing with symphony groups. 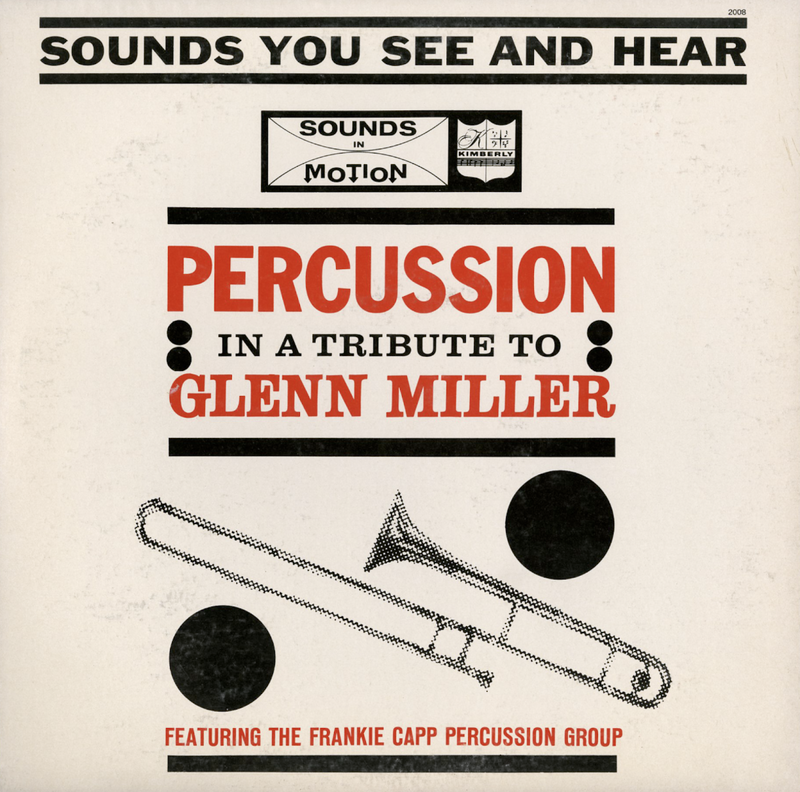 All twelve of these selections originally appear on the Circle label.